During the July 16, 2010 show, Alex Jones asked listeners to search for the term “The Obama Deception” on Google, Yahoo, and other major search engines in an effort to show the strength and influence of the patriot movement. 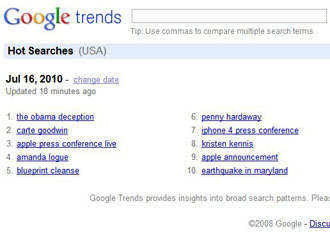 You responded en masse and within two hours of putting out the call, The Obama Deception was the number one hot search topic on Google. This is a testament to the outstanding unity and wide-reaching numbers of not only our audience, but the patriot movement as a whole. Thank you. This single effort will help to wake up hundreds of thousands more to the truth. Though we did accomplish an amazing thing inside of a small period of time, it is up to you to keep this momentum up. 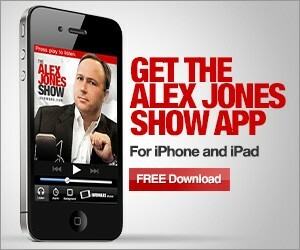 Alex Jones is putting a call out to all patriots and friends of liberty. For the next week, take about 5 minutes per day when you get online and type in “The Obama Deception” (or copy and paste) and make these searches over and over again; then click through to the links and drive the livelihood and popularity of the term “The Obama Deception” off the charts. The mainstream gate keepers cannot silence us. By utilizing search engine judo we can use their tools of mental control and distraction and wake up millions to the information contained in that powerful film, and so many other patriot works. Search The Obama Deception spread the word and let’s take our country back from the globalists. Apple today announced that they are offering free bumpers and even full refunds to consumers that have been experiencing ongoing signal strength issues with the 4th generation iPhone. Carte Goodwin has been appointed to replace Sen. Robert Byrd. This news fills the mainstream media but was shadowed by the immense response to the call for Obama Deception searches and tweets. The power of the alternative media is in our hands.